As we discussed in the previous post, there are many computer based project management tools. From them Microsoft Project is a tool that is widely used today because it has become so easy because now Microsoft Project comes with Office365. Though the Project software comes as a paid one, for the DreamSpark account holders Microsoft Project is free. 🙂 So Keep calm & download it through your precious DreamSpark account undergrads! Ok, the others… if you really interested on the software, don’t hesitate. The investment you making worth a lot. If you going to try it for managing the projects in your organization, trust me you’ll see a huge improvement of productivity. 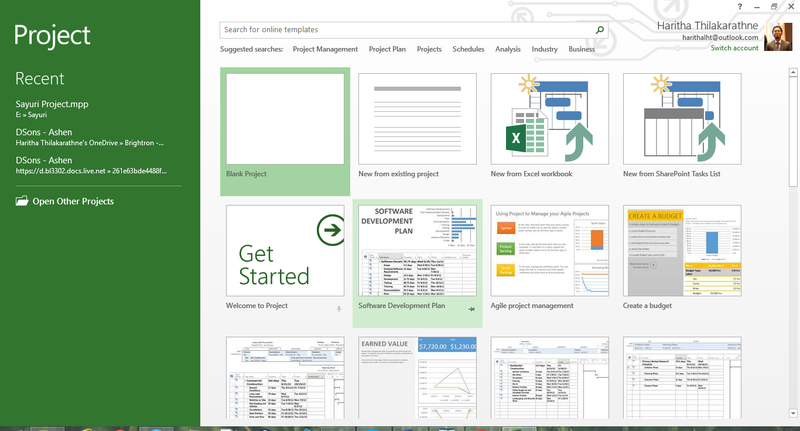 Or you can try Microsoft Project for a trail period & am pretty sure you’ll fall in love with it. Let’s get started. Here I’m using Microsoft Project 2013 for the demonstrations. At the first sight you’ll see an interface that is seems very familiar for you. For those who are familiar with Microsoft Office applications such as Word, excel & PowerPoint this wouldn’t be an alien software for them. Most of the controllers and the UI looks same. So it’s easy to cope with even for a newbie. For the demonstration I’ll go through this scenario. You are the team leader of a software developing project at the university. Your task is to develop a student registration system within 4 months of time. Your team consist of 5 members including you. Most of the system requirements can be fully extracted in the initial phase. You have to present the progress of your project to your supervisor weekly. Here we go! For this I selected a blank project. Let’s start from the scratch. An Excel like screen comes. Don’t worry we’ll run through all the gadgets one by one. Basically MS Project based on the Gantt charts. So the rows are for the tasks. Before going for defining the tasks let’s define the project schedule. You’ll get a dialog that can define the start date, end date kind of information about the project. Here you can mention the working time too. Normally the work calendar is set for an 8 hour work shift per a day with weekend holidays. In this standard calendar, week starts on Sunday. Here the project status date means the date that we wish to consider when generating progress reports in the future. You can change it as you want. 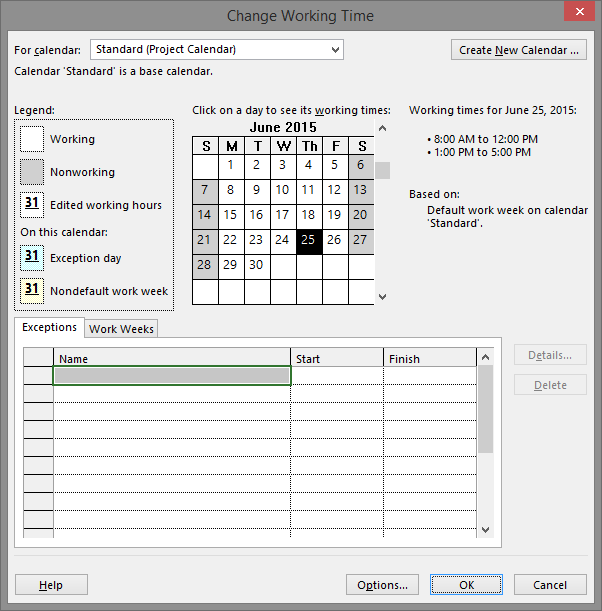 If you wish to change the working hours and wish to make your own calendar for the project go to Project – > Change working time and customize your calendar. When the project is ongoing, you can change the working time. But note that the project schedule will automatically adjust according to the new calendar. Gantt chart plays the main role in each project. 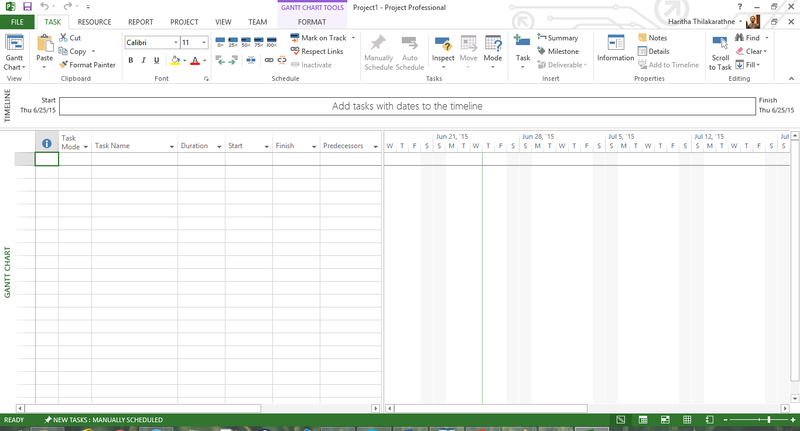 You have to select task – > Gantt chart to get the spreadsheet where you can enter the task information. Task name, duration, start date, end date, predecessors and many more information about each activity can be inserted to this spreadsheet. To list out the tasks, it’s better to get a clear idea on the Work Break down Structure (WBS) of your project. WBS is a hierarchical and incremental decomposition of the project into phases, deliverables and work packages. It’s a tree like structure. It’s better to decompose the complex tasks into sub tasks and put them in separate rows. Here you can see the developing phase has decomposed to four sub tasks. There are two task modes as Auto scheduled & manually scheduled. You can choose the desired mode according to your requirement. The duration for each task can be given in weeks, months or days etc… Note that when counting days the holidays and the weekends are excluded. Only working days are counted here. The software itself calculates the start date and the end date. The Predecessors field lists the task ID numbers for the predecessor tasks on which the task depends before it can be started or finished. Each predecessor is linked to the task by a specific type of task dependency and a lead time or lag time. Simply you can say what draw the relationships between tasks by predecessors. After mapping the relationships between the tasks in the WBS the software draws the Gantt chart for us. Further we can adjust the durations and WBS according to the submission requirements we have. 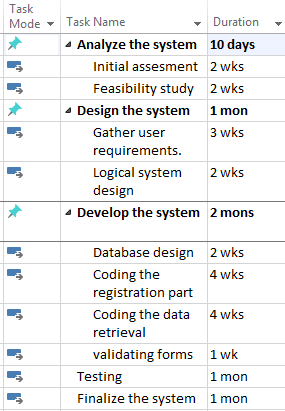 In a case if a university project, you can align the WBS according to the schedule of the progress presentations that you’ve to do. That’s it! 🙂 We took the first step. Milestones, Critical path, Network diagrams, etc… let’s discuss about these cool features of Microsoft Project soon. Project Management, though it sounds like a serious topic, it is not an alien matter. Each and every day we are practicing it. Whether we are brushing teeth or building a skyscraper we should go through a planned process. Initiating, planning, executing, monitoring/controlling and closing out every project requires some knowledge and expertise. In organizations this is more likely to get completed with a trained project manager. Project managers get things done. This is how it is defined by the Association of Project Management (APM). With better project management practices it is easy to achieve the desired goal with less time and resource waste. Here I’ve list down some benefits that we can get with good project management practices. But with poor project management? It’s a disaster! Poorly managed project would be a waste of million dollars and also increase the stress of the managers as well as the workers. So practicing project management disciplines and adopting the projects to them is a MUST in all organizations today. Life? Yeah, even in life you have to manage your day today tasks. In the IT industry there are many PM tools using to manage projects. Most of them allow to create work break down structures, task & resource allocation, define milestones, etc… & it’s also easy to share the PM-workbench with your team and peer workers. Microsoft Project, Basecamp, Atlassian, Wrike, JIRA, Asana, Trello… are some popular project management platforms used by many IT companies to enhance their team collaboration and to get their projects on to track. (Here’s a complete List of PM Tools)Let’s take a look on some popular PM platforms. Asana is free for most people (you only need to pay once you get up to 15 or more people working on the same projects), and it’s just as good a corporate project or task manager as it is a to-do manager for your own pet projects or ideas. 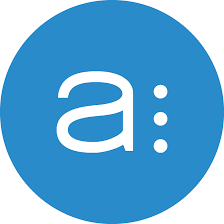 A mobile app for Android & IPhone is available for Asana. It makes so easy to maintain to-do lists of daily rituals with this tool. If you’re a fan of Personal Kanban, or you like to use cards or post-it notes arranged in categories to organize your thoughts and your tasks, Trello will appeal to you. Trello is fast, flexible, and even fun to use, and in minutes you’ll organize all of the components for your projects into columns and cards that are easy to drag around, add supporting details to, comment on, and assign from person to person on your team. You can create different boards for different projects, set due dates or times for each card or set of cards, and more. Trello is even available on iOS, Android & Windows Phone, and its drag-and-drop interface works well on mobile devices. 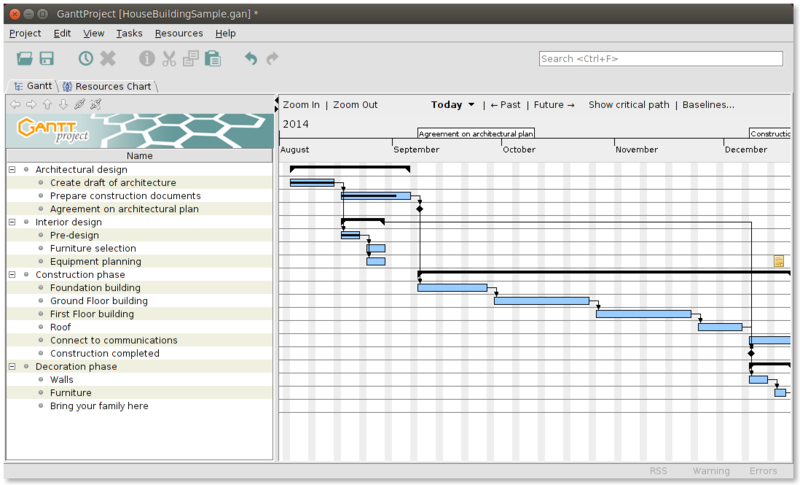 If Gantt chart is your thing, GanttProject might be for you. This free open source project management and scheduling app allows users to create and organize tasks and milestones. It can also create Gantt and PERT charts as well as reports in HTML or PDF formats. On the downside, it doesn’t offer any of the social features. But if your business doesn’t need those features, this free app may be appealing. Microsoft Project is a paid software. With Office365 you can pay monthly & use it as a cloud subscription. For the students who have the Microsoft DreamSpark subscription it’s free! So why don’t you downloading it & trying? I bet you can reduce half of your work load of project documentation with this. 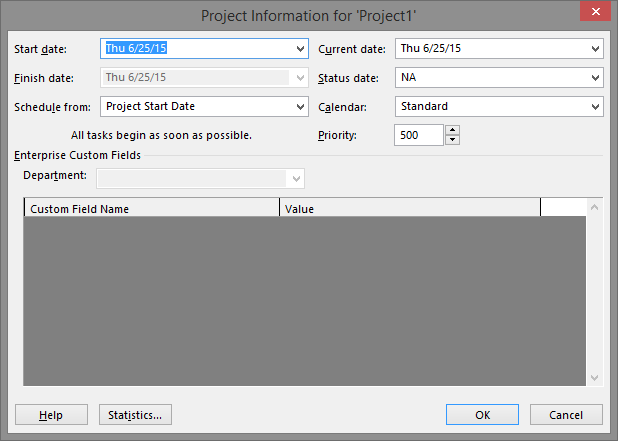 In the future posts let’s go through some cool features of Microsoft Project that can use to manage your projects easily.